A U.S. visa is an authorization, typically in the form of a stamp inside a passport, which demonstrates that a U.S. consular official has determined that the traveler is eligible to enter the U.S. for the purposes stated in the visa. The United States issues two classes of visas, an Immigrant Visa and a Non-Immigrant Visa. Choosing which visa to request is an important decision, and will largely depend on the reasons for coming to the U.S., as well as the visitor’s intentions regarding immigration. An Immigrant Visa is issued to aliens who intend to permanently reside in the U.S., whereas a Non-Immigrant Visa is issued to those who are coming to the U.S. for a specific, temporary purpose, such as travel, business, medical treatment, temporary work or study. Immigrant Visas are for those who wish to stay and work in the United States, or who would like to seek U.S. citizenship. However, there are a limited number of these visas available each year. Immigrant Visas are subject to numerical limits and once the quota is filled, applicants are placed on a waiting list until a visa becomes available. Non-Immigrant Visas are easier to obtain than Immigrant Visas, and usually do not involve a waiting list. However, Non-Immigrant Visas limit the length of time and scope of activities the visitor may engage in while in the U.S. For example, those granted a B-2 Tourist Visa are only permitted to undertake activities consistent with being a visitor in another country, such as sightseeing or visiting with relatives or friends; they are not permitted to work or enroll in school. Visitors in the U.S. on one type of visa may be able to change the visa status to another category, provided the qualifications are met. An experienced immigration attorney can help facilitate this process. Within each category, the various types of visas are grouped within subcategories. 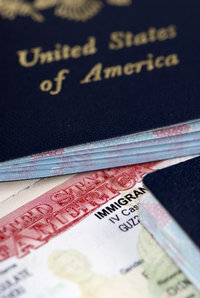 There are many different types of Non-Immigrant Visas, each designed to serve a specific purpose, such as tourists, business visitors, specialty occupations, media professionals, religious workers, temporary workers, medical treatment, government officials, students, exchange visitors, and fiancées of US citizens. Immigrant Visa categories include employer-sponsored immigrants, family-sponsored immigrants, immediate relatives of U.S. citizens and special immigrants. Not every traveler is required to obtain a visa. If your home country is part of the Visa Waiver Program you may not need a visa at all, though you will not be able to work or permanently reside in the U.S. Anyone who wants to travel to the U.S. for purposes of living or working herein is required to obtain an Immigrant Visa. Whether applying for an Immigrant Visa or a Non-Immigrant Visa, it is vital that you apply for the right type of visa. Consulting with an experienced immigration lawyer can save money and time, by limiting delays caused by incomplete applications or requests for the wrong type of visa. Also, by ensuring you obtain the correct visa, you can avoid engaging in unauthorized activities while in the United States.